VIP Shopper Club members are invited for a two-day, private event featuring exclusive savings offers from merchants and prize drawings. Johnson Creek Premium Outlets, 575 W. Linmar Ln. Round up friends and family, form a team and join the fun! Each team must register before the start of the contest. The team captain must ensure that all members have signed in and paid for their entrance fee. There will be four (4) rounds of questions consisting of: 20 questions, 5 Music Questions, 5 Picture Questions. Each round will last 20 minutes. No books, reference materials, cell phones, laptops or other reference materials are allowed. Answers to all questions must be written on the answer sheet that is provided at the beginning of each round. Only one answer sheet will be turned in for each team. Team number must be marked on the answer sheet. All answers by the judges are final. Easter in Cambridge, Wisconsin, is a time for celebration. Check out the events we have planned for Saturday, 4/12/14. Breakfast With The Easter Bunny – 8-10am at Keystone Grill, 206 W. Main St.
Easter Bonnet Parade – 10:15am in Veterans Park, 100 E. Main St.
Easter Bonnet Parade – Stroll the streets of Cambridge in style wearing your favorite hat, whether fancy, flirty or fun. 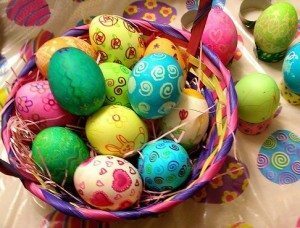 The Easter Bonnet Parade starts at the top of Main St. at Veteran’s Park at 10:15 am. The parade will be led by Mr. Peter Cottontail. All in attendance are promised a hopping good time. Sponsored by Simone’s Chapeaux & Creations. Optimist Club Easter Egg Hunt – 11am Ripley Park, N4310 Park Road, Cambridge – Enjoy this long-standing tradition at beautiful Ripley Park. Let the kids run around and grab their Easter Eggs. Ready, set, go! Previous postFish Fry Review Crew - Norm's Hideaway Next postIt’s Farmers’ Market Season in Jefferson County!